There’s just no stopping David Jeffrey’s Ballymena United this season. Just when it looked they were heading for extra-time, Jude Winchester scored a last-gasp winner to give United the narrowest of wins. The midfielder’s deflected shot in the second minute of stoppage time was enough to give United a 1-0 win over a dogged Ards side on a miserable night in Bangor. The first chance of note fell to Ballymena’s in form forward Adam Lecky in the 10th minute, who ghosted past Adam McAleenan before firing a shot at goal, but Jason Mooney made a smart save. Then it was Leroy Millar turn to scare Ards. He nipped the ball away from Josh Kelly before drilling a 20-yard shot against the post, with Mooney beaten. The former York City and Tranmere Rovers goalkeeper was called into action in the 21st minute. He blocked a Lecky effort when the former Ballinamallard United man looked certain to score from close range. Ards did look lively on the break in the first half. Their best effort came in the 29th minute when Jonny Frazer flashed a 20-yard half volley just past the post. Ards made a bright start to the second half, with Mark Kelly introduced into the action. Oddly, centre-back Johnny Taylor found himself on the right-wing and he put a dangerous cross along the front of goal, but Kelly could not make contact. He claimed he was held back by a Ballymena defender. Ards had a great chance to win the game with three minute left on the clock when Jonny Frazer picked out sub Marc McKenna, but he blazed the ball over the goal from just inside the area. With extra-time looming, Ards pushed numbers up for a stoppage time corner-kick, but when Kym Nelson’s set-piece was over hit Ballymena sprung into action. 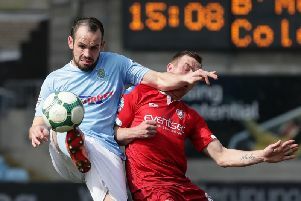 A counter-attack soon turned into pinball inside the Ards area, with Jude Winchester finding the net with the help of at least on deflection, to put Ballymena into the semi-finals. Incredibly that wasn’t the last action of the game. In the fourth minute of stoppage time, a scramble inside the Ballymena area gifted Mark Kelly an open net, but he steered his shot agonisingly wide.